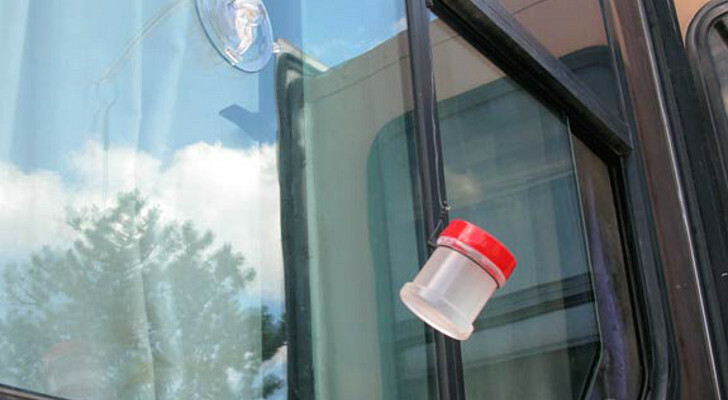 Getting in and out of an RV can be a chore – especially for dogs. This is particularly the case if you have difficulty climbing stairs or if you have small children that need access. 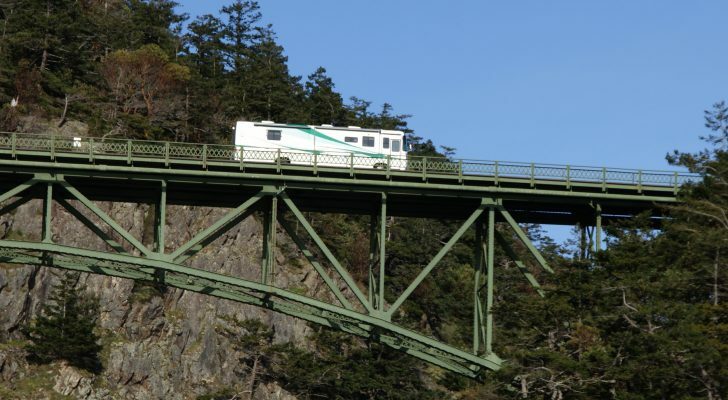 Some RV manufacturers install stairs for use but many are small and frankly do not work well. 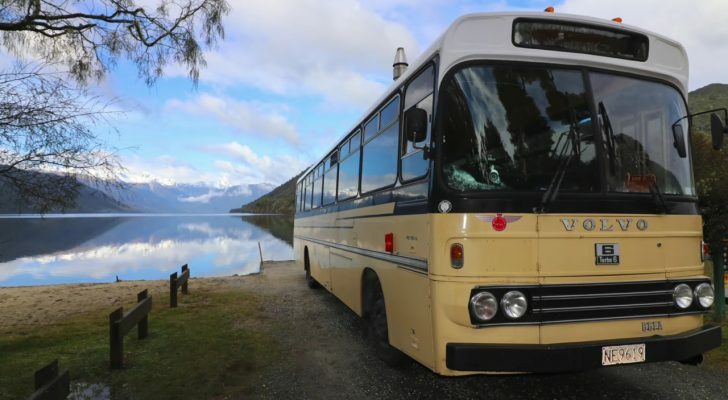 Many RV owners look for a more permanent feeling solution as a replacement. 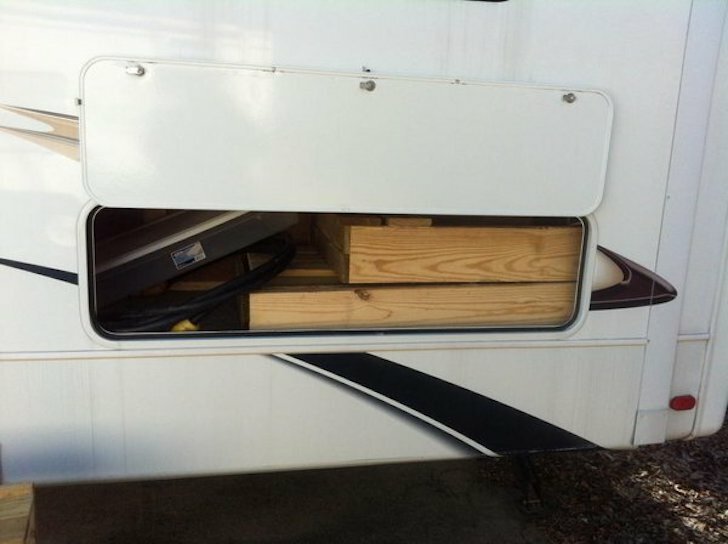 Though we have seen creative RV stair designs before, we wanted to share this most recent creation by a gentleman that goes by MrYesterday at the RV.net forums. 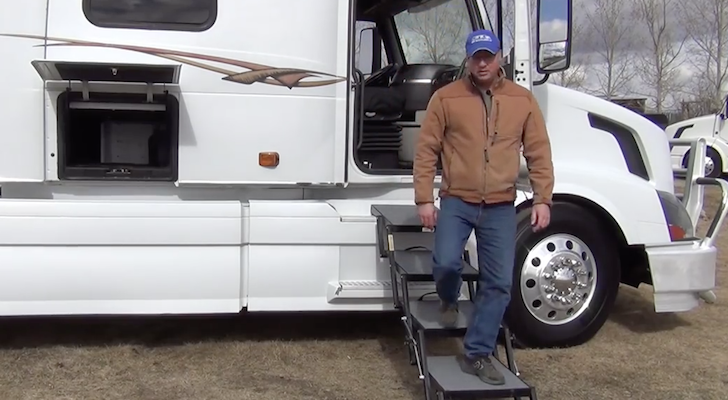 He came up with an idea for portable steps outside of his 2010 Keystone Montana 3750 FL fifth wheel travel trailer using traditional lumber you can find at any home improvement store. Notice the fastening bars on the sides of the steps. MrYesterday, who is a full-timer living with his family, was looking for something that was sturdy, functional, and prevented injury of his young son. 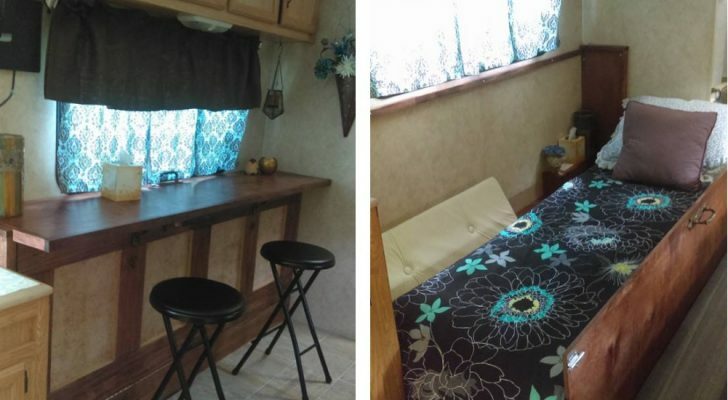 He originally built a miniature porch that took up the entire bed of his truck and took 15 minutes to setup and level. 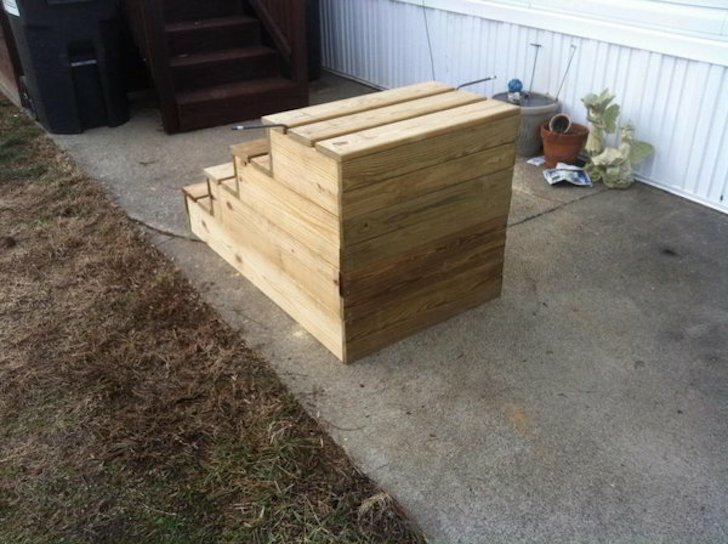 After some consideration he decided to build a set of collapsible portable steps that had a deep landing for his son. He made them in such a way that he could store them in his RV’s basement. 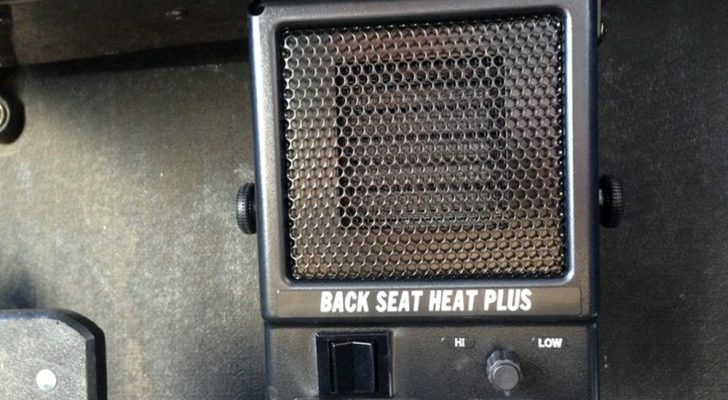 The design, as professional as it may look, was a product of “figuring it out as you go”. He started with a large pile of wood and began measuring and piecing it together. 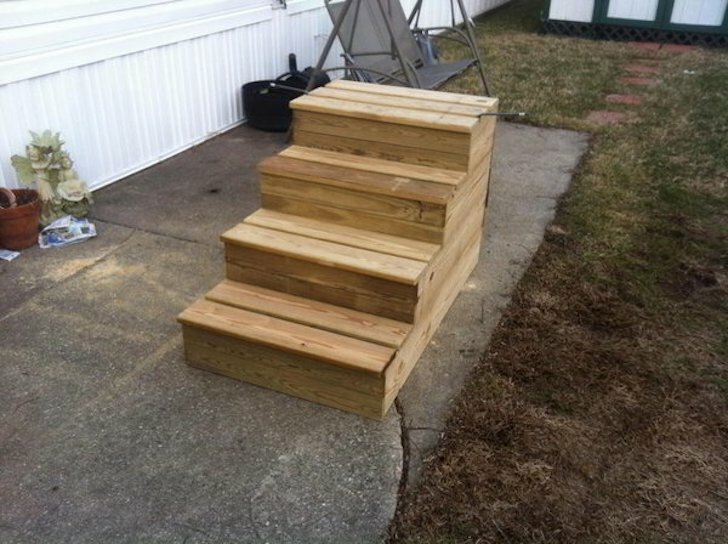 When finished, he had something that fit his needs and a set of portable steps that others would be envious of. One notable feature, the dimensions work in such a way that all the steps break down and fit inside each other to save space. They are all held together not by traditional fasteners, but by dropping a bar down through them to connect all the levels of steps. 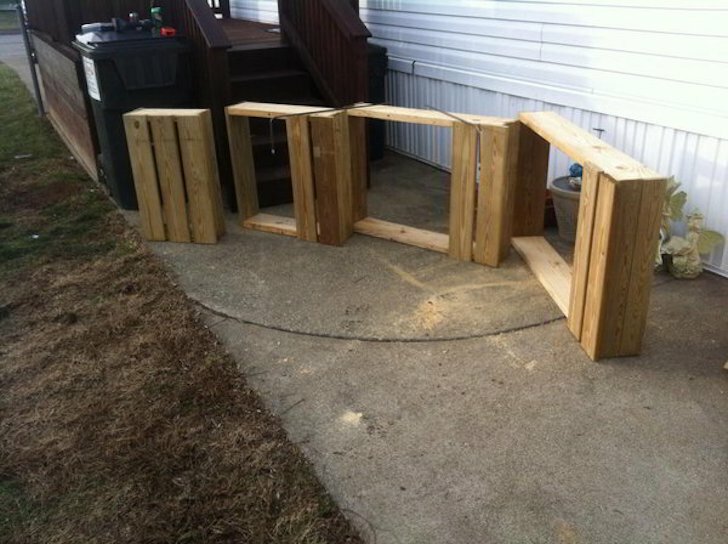 The fifth wheel portable steps measure 34” tall x 30” wide x 34” deep. 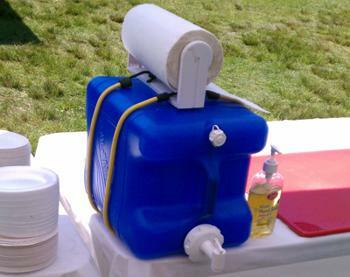 It is estimated that the total cost for materials was around $80. According to MrYesterday, all you need to do is measure the area you intend to store them in and use that as the size of your largest step and the 3rd largest step. Lastly make sure the other steps simply fit inside of those. 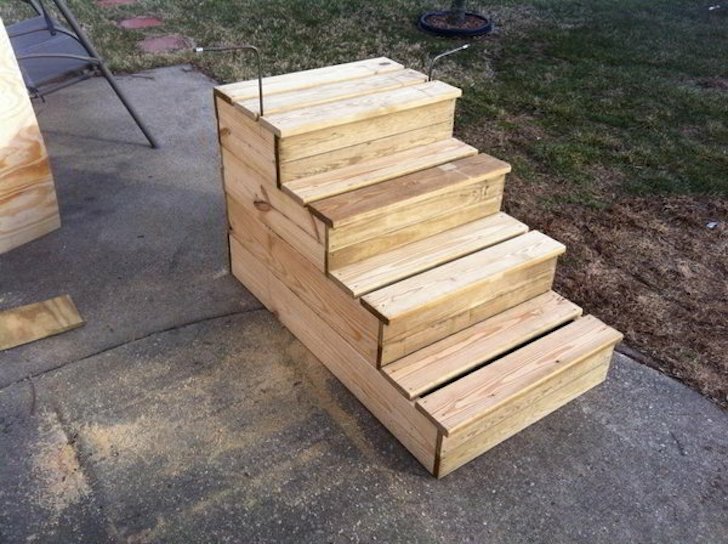 What we admire most about these portable steps is that it doesn’t require expert carpentry skills to do this. 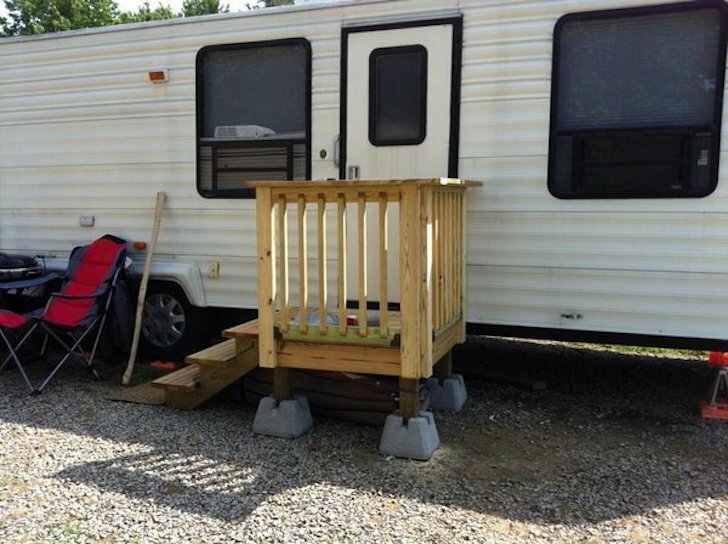 If you take your time and know how to work a saw and a drill you should be able to create a nice set of collapsible portable steps for any size travel trailer or motorhome. 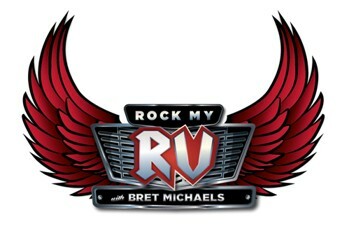 See more information and photos at RV.Net.